Faceting a precious gemstone is as much art as science, and must still be done by hand in a multi-step operation involving preparation, grinding, pre-polishing, and final polishing. Processing time is related to the hardness, size, and complexity of the material being faceted. There are not many full-time professional faceters in the USA, and reputable shops tend to stay booked for a period from weeks to months ahead of time. 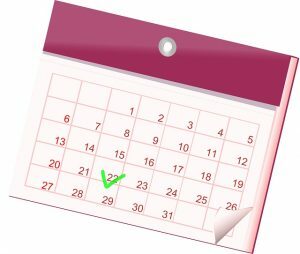 Emergency repairs and date-sensitive jobs like anniversaries and birthdays complicate scheduling. And, we give preference to engagement projects and anyone on active deployment in the military. So, turnaround times can be as short as days or as long as a year or more for large and complicated projects. Your project is unique, and we can only provide an estimate of turnaround time after we’ve evaluated your rough in detail. You can begin the process yourself, with our free rough evaluation class. Cutting your precious gem is a bit like getting a tattoo: You don’t get a do-over if the artist isn’t good. Our senior artist time bills at $200 per hour and junior artist time at $75 per hour. This is comparable with the average rates for a good tattoo artist. Although we cannot make an estimate for maximizing the beauty and value of a gemstone without doing a technical evaluation of that gemstone, in general nobody is going to complete even the smallest and simplest of gemstones in less than one hour. So, the smallest, simplest projects will require a budget of just over $100, while many projects will require a greater investment. We charge a fee for doing the technical analysis necessary to make a binding quote because unwrapping, inspecting, analyzing, planning a strategy for cutting, consulting with the client, re-packing, and driving to the post office consume significant amounts of time. You can download the form for sending your rough parcel to us here. Meantime, we are happy to give you a first impression of your gem material based on a handful of good-quality (in-focus) photos taken on a white piece of paper. Connect with me here for details on sending your photos for the free photo evaluation. You can only tell so much from even the best photographs. It is not possible to make credible plans – or credible estimates about cutting a precious stone – without analyzing it directly. And, we don’t make offers of service we can’t be confident of fulfilling. We’ve got to have the stone in the studio to give you good answers to your questions about time, best use, best value, labor required, etc. Though our studios are located in Southern Oregon, we service clients and suppliers around the world, and employ apprentices and gold smiths across the USA through the wonders of secure Registered Mail. We do not have a retail location open to the public. And, as much as we enjoy visiting with our clients, out of consideration for their privacy and security, we do not offer visits to our secure studio location. However, on occasion I will meet with clients in person at a satellite office or at the client’s location to evaluate and discuss very-high-end gemstone or jewelry projects. There may be a consultation fee attached to consulting appointments that take me away from the studio. What size will I get back? This depends on many variables, including the original size and shape of a gem material, structural integrity of the material, inclusions, cleavages, twinning, color zoning, color direction, etc. The overall average recovery of commercial (overseas) cutting using flat-faceting techniques hovers below 20%. That means for commercial overseas cutting you need to begin with a 5+ carat rough to get a 1-carat finished gem back. The overall average recovery with custom American cutting will be closer to 30%, and will range widely both upward and downward from there, depending on the factors I mentioned above. We also have the option of using both carving and fantasy-cutting techniques to enhance recovery, at times capturing 80% or more of the original weight into a finished piece. Recovery in an individual piece is highly dependent on the features of that piece! Cutting for weight alone often produces a lower net value than cutting to maximize the color presentation – which accounts for 60% to 70% of gemstone value. We will give you a reasonable estimate of the likely finished weight of a gem during the hands-on evaluation and consultation phase of our work for you. This will not be a guarantee, but an estimate based on everything going well. Probably. But, we aren’t a gemological laboratory, and we don’t do gemstone identification as a service. If you send us a sample, we can give a probable identification, but if certified identification is what you want, it’s best to send the stone to a laboratory that specializes in that. Will you appraise my rough? Any stone can have internal stresses and break when you try to cut it. 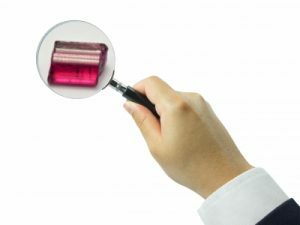 Due to that speculative nature, nobody does meaningful “appraisals” of rough gems, and estimates from people who aren’t in the buying market are completely meaningless. Those with the expertise to know the market for a rough stone only know because they are IN the market. They will either offer to buy it – or not. And, an offering price is a negotiation, not an appraisal. As with anything, it’s “worth” what someone is willing to pay for it. And, the measure of that happens when something is offered for sale. Will you appraise the gem after cutting? “Appraised value” means “insurance replacement”, which is completely different from wholesale or retail market values. While we will offer our opinion about the likely wholesale value of finished works, this is for shipping insurance purposes only, and not to be interpreted as an appraisal. Appraisal is a specialized field, and appraisals are legal documents, mostly for insurance purposes. This is not our business focus. We can recommend professional appraisers, but do not maintain one on staff. Can you cut my stone in the shape I choose? That may be possible. Occasionally, and with large pieces of inexpensive materials, we can force a stone into a desired shape (usually at a great loss of yield). Inside any rough gem are likely to be flaws and inclusions that will influence the usable portion of the material and the shape and pattern that will recover best value. Also, the color may be zoned or directional – which will influence the direction in which the stone may be faced-up, and best design selection for value. 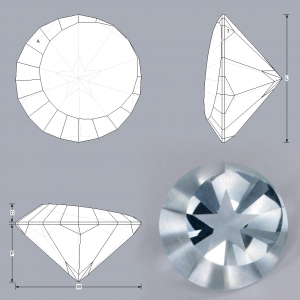 You are generally far better off allowing a skilled professional cutter create the best presentation of the gem. Who will buy my stone? This question is best asked before acquiring the rough gems. And, if you don’t already know the answer to this question, I recommend you discover it before investing further. Will you sell my stone for me? Maybe. If you have an extraordinary collector’s piece, I may alert collectors and high-end designers I know about the availability, or help broker it in some fashion. Except for synthetics, most of the “faceting rough” we see on e-Bay is there to be dumped due to being low quality or entirely unsuitable for cutting. In most cases, the material won’t support good yield, good color, or good clarity. And, in many cases, it won’t even hold together for the cutting process. Rough evaluation is technical, time-consuming, and tedious. Buying on eBay puts you on the wrong end of that process, almost guaranteeing you’re going to get low-grade material. If you buy direct from a skilled cutter part of the price of the high-quality stone is the technical expertise, time, and tedious labor of rough evaluation. 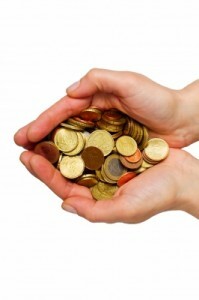 You will be including that value in your investment, rather than spending money to dabble with the process. On the other hand, if you just want to select your own material as part of the fun and experience of being involved in the process, that’s great. And, I encourage that kind of experimentation – as long as you understand that some of your money is buying experience value rather than gem value. To help you with that, check out my free class on gemstone rough evaluation, and contact me so I can invite you to send photos for a free photo-based initial consultation. 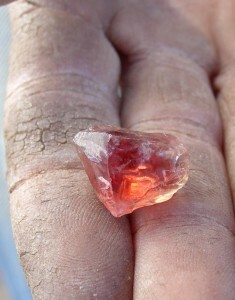 If you found it at Montana Sapphire digs, or a Sunstone mine in Oregon, you may very well have something worth cutting. If you found it at a bucket-dig in the Carolinas, the chances of something viable are pretty slim. Check out our free class on faceting rough evaluation, or contact me and I’ll invite you to send photos for a free photo-based initial consultation. Can my stone be faceted? 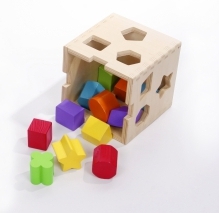 The main considerations include structural integrity, shape, and clarity. To learn more about this, have a look at our free faceting rough evaluation class here. 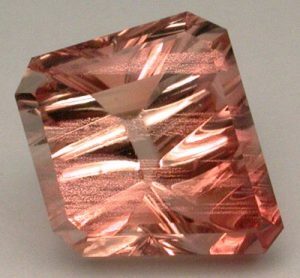 The final value of your Oregon Sunstone will depend heavily on the expertise and experience of the artist who cuts it for you because this material commonly has issues of fractures, cleavages, unusual shapes, Schiller inclusions, and directional color – especially the red/green dichroic material. Odd shapes may be best served with fantasy cutting or carving. 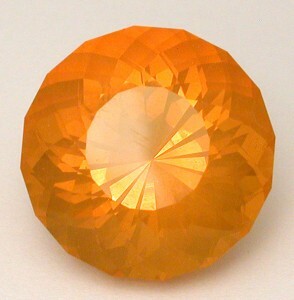 Schiller inclusions may be too plentiful for a faceted stone to return light effectively, resulting in dark or dull stones. Cabochon or carving may be the best presentation of the gem, instead. Directional color requires expert technical orientation and faceting to prevent the colors from mixing into a dark, ugly, muddy color. There are very few artists who can manage this issue with technical precision (Most just guess). 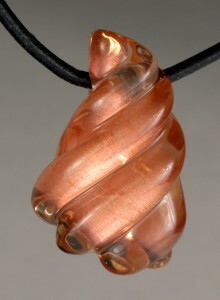 The value of your transparent Opal / Fire Opal will depend on the expert artist managing issues related to water content. 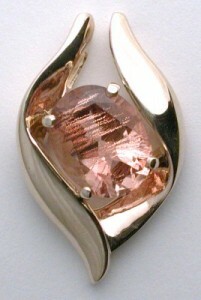 Fire Opal is heat and shock sensitive. And, it may crack, craze, or hydrophane (cloud) with changes in ambient humidity. These issues can be somewhat predictable based on the origin of the material, with rough from Opal Butte, Juniper Ridge, Virgin Valley, and Mexico having quite different behaviors. Any Fire Opal should be “seasoned” (acclimated to ambient humidity) for a period of 6 – 12 months to reduce the risks of breakage this species is prone to. Fire Opal is also often “sleepy” due to colloidal inclusions and a low refractive index, so the faceting artist must select designs carefully to present the stone in a flattering way. Fire Opal will remain sensitive to shock and changes in humidity even after polishing: A finished stone that does fine in Los Angeles for years may be ruined within a day of arriving in a dry location like Phoenix. Sapphire, and especially Ruby rough purchased on eBay will usually be of very low grade or will be glass-filled. Dark material will appear black after cutting because it absorbs too much of the light passing through it. And, glass-filled material is unstable. It may disintegrate in cutting; is very difficult to polish; and will be ruined in a moment if exposed to things like common household cleaners which oxidize the lead in the glass. It’s best to leave cheap Sapphire alone. 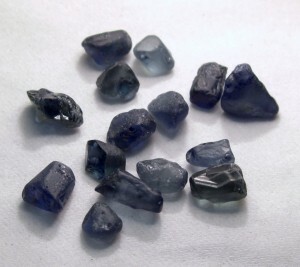 The value of your quality Sapphire rough (when you find some) depends on a skilled technician orienting the color properly and selecting the right design elements to insure a good color presentation and that it doesn’t black-out in cutting. You want your Sapphire to look like this photo (left). Most of the garnet you find on the Internet will be “specimen-grade”, or too-dark for light to pass through a faceted stone and sparkle. You can learn more about how to tell if your garnet is too dark from our free rough evaluation, class. A good deal of the Tourmaline you will find will be too included, or will have structural flaws. Much will also have a black or otherwise ugly C axis. 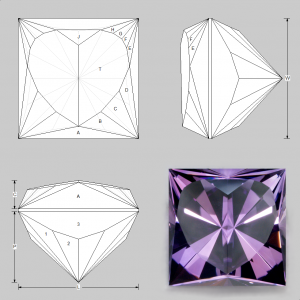 Depending on proportions and orientation of the crystal, this can negate the stone’s viability for faceting – or insure a very low value if it can be faceted at all. If you find Tourmaline that is viable, the value of your finished gems will depend strongly on the faceting artist’s expertise managing dichroic material through proper orientation, selection of design elements, and execution of the design with alignment to the crystal axes. You can learn more about the axes of Tourmaline in our free rough evaluation class. 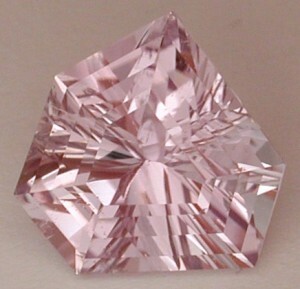 Much Kunzite is also not “color stable”: It will fade if exposed to sunlight. 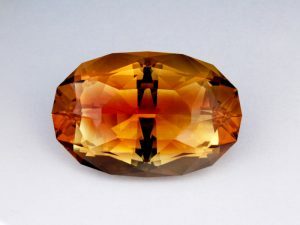 The color that is found in the stone is directional – showing most strongly on the optic axis – which is usually not the direction of greatest yield (or structural stability). So, a decision must always be taken how to recover the most value from it. Kunzite has perfect cleavage. It’s put together like a stack of tooth-picks held together with spit. The hardness is extremely variable according to direction across the crystal, and the pieces tend to be large. Spodumene must be ground slowly using only a medium cutting lap, or the cleavage will “open” (often splitting the stone in half). Many Spodumene gems have been known to spontaneously split in half after cutting, even if everything was done right. Rough Kunzite that has been subject to rough handling (impacts, etc) may have internal stresses that will show themselves during processing – when the stone splits in half. Most American faceters will not even attempt to cut Spodumene. 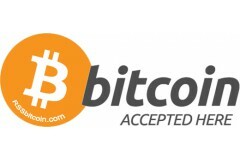 We are one of the few shops that will do it, and successfully. Should my stone be faceted? The answer to this depends on your goals. If you are seeking a Souvenir / Personal Enjoyment / Family Heirloom, then the answer is usually “yes” – if the process falls within your budget. 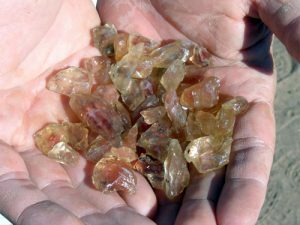 Finding gemstones in the field is part of the treasure-hunting adventure – which can be greatly enhanced, and passed through generations by cutting and setting those treasures. We do lots of this for clients. If you are seeking economic recovery – you want to sell the stone, or some jewelry made from it, for a profit, the answer is often “no”. This is especially true if you are not already established in the gem and jewelry business because you won’t have a ready market. This kind of strategy puts you in competition with professionals who have access to wide variety of gems through very convenient, trusted, and cheap channels. Would you compete with a professional boxer? Most of the cutting we do for economic recovery is for established members of the trade, who have a known market for the end results. What are my options besides faceting? Options for maximizing value of precious gem material include faceting, cutting en-cabochon, carving, wire-wrapping or otherwise setting as-is, and maintaining as a specimen. 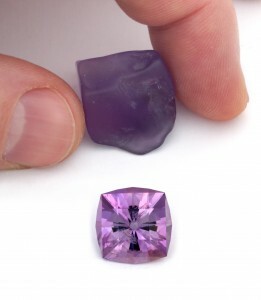 Faceting is a strategy reserved for the most rare-quality of transparent gem finds. A stone has to have the size, shape, structural integrity, clarity, and color to make faceting worthwhile. But, when we can maximize existing value through faceting the outcome can be spectacular. Cutting en-cabochon is reserved for the next tier of quality in terms of clarity – and/or for materials that are not suitably shaped for faceting. The stone still has to be structurally sound enough to withstand the process. And, significant value can be added by cutting in this way. 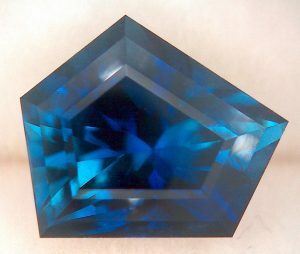 Carving is especially useful for very large gems of insufficient clarity for faceting – or where the shape would require too much loss if the gem were faceted. Carvings are either representative (like an animal figurine) or abstract/optical – just showcasing some feature of the material through light, texture, and shape. We can add significant value to a gem through carving. Wire-wrapping or other setting as-is. Often, a gem crystal can be a great piece of jewelry by just wire-wrapping or creating a custom setting to show of the crystal in its natural shape. This is often inexpensive, quick, and easy. And, making a crystal wearable definitely adds value to it. Often, a really special crystal specimen is most valuable in its natural state – as a display piece for a museum or collector. This is an entire market unto itself, and may be a good strategy for those who want to monetize unique specimens they have found. Is my stone suitable for daily ring wear? If your stone is a Spinel, Chrysoberyl, Sapphire, or Diamond, then it probably is. If it is any other mineral, the answer is “no” – and putting it into a ring for daily wear will almost certainly cause a loss of beauty and value over time. Materials like Zircon, Quartz, Sunstone, Tanzanite, and Opal are especially vulnerable to damage, and will generally deteriorate rapidly with daily wear. If you are building a religious artifact (we consider engagement rings religious artifacts), we strongly suggest using one of the four hardest gemstones we’ve recommended above. Luckily, Spinel comes in many shades, and Sapphire is available in almost any color you can imagine. Stones other than those mentioned will retain their beauty and value best if placed in settings that get less abuse – pendants or earrings. For those determined to make daily-wear rings out of soft materials, we offer Sapphire Armoring™ – bonding a protective layer of synthetic colorless sapphire to the top of your gem to protect it from abrasion. This is not a guarantee against scratches and breakage, but will certainly make the stone less prone to those things. What is the best jewelry for a personal heirloom setting? You’ve got a gem that merits custom cutting and setting – what is the best thing to do with it to preserve maximum value across time? My first recommendation is to keep it out of a high-wear environment, so don’t put it in a ring. A pendant will be much better for the stone – and it doesn’t need resizing over time or when passed-down through generations. I recommend the pendant setting be simple and classic rather than quirky or strange. This makes your heirloom timeless – suitable for wear and maximally valuable across the generations who will enjoy it. Why should you work with the Gemstone Artist? We are internationally-recognized for our published articles and videos on the art. We run a prestigious international school of the art. We focus on maximizing the value in your stone, not on mass production. We have technical expertise to maximize the value of our clients’ stones – even very technically-challenging specimens. We use the newest equipment, including custom-designed and custom-built high-tech specialty equipment. We have consulted and appeared on the Travel Channel’s Cash and Treasures series twice. We offer friendly telephone consultation on stones, value, designs, jewelry – answers like you find on our web sites and in our free classes. We provide a personal touch and connection with an artist who cares about your long-term happiness. We talk to you the way we would want to be talked to. And, we handle your job the way we would if it were our own. And, we don’t even take-on every job that comes along – just those that are interesting, and that offer us the opportunity to work with interesting and fun clients – like you! I’ll personally answer any other questions you have. Just ask! 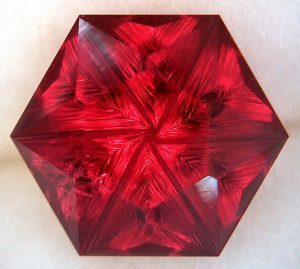 i have a rough hauyne appox 7×5 mm i would like it faceted in its freeform shape..can you do this ? if so how much to do this? We CAN cut Turquouise. We do not do it often.